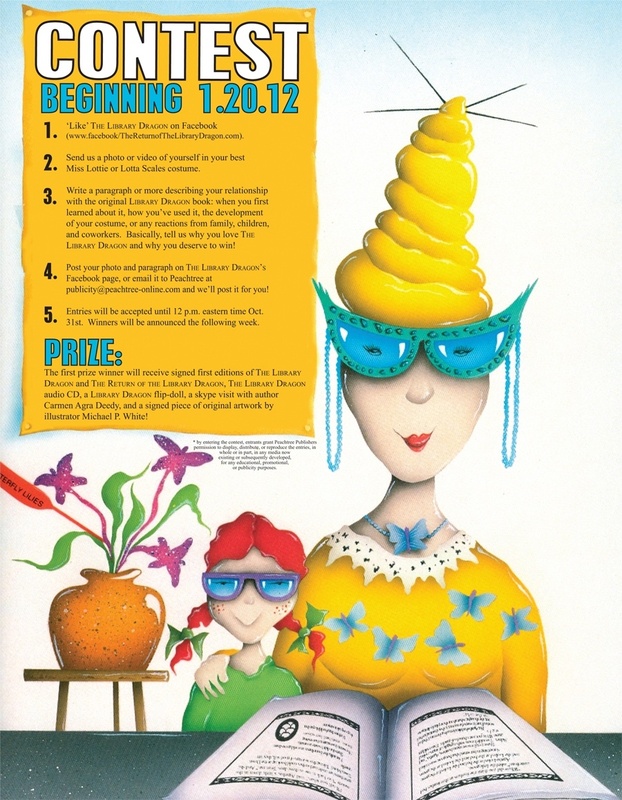 Send Peachtree Publishers a photo or video of yourself in your best Miss Lottie or Lotta Scales costume. You may post this on The Library Dragon’s Facebook page, or e-mail it to publicity@peachtree-online.com. Write a paragraph or more describing your relationship with the original Library Dragon book: when you first learned about it, how you’ve used it, the development of your costume, or any reactions from family, children, and coworkers. Basically, tell us why you love the Library Dragon and why you deserve to win! Post your photo and paragraph on The Library Dragon’s Facebook page, or e-mail it to publicity@peachtree-online.com and we’ll post it for you! * by entering the contest, entrants grant Peachtree Publishers permission to display, distribute, or reproduce the entries, in whole or in part, in any media now existing or subsequently developed, for any educational, promotional, or publicity purposes. The first prize winner will receive signed first editions of The Library Dragon and The Return of the Library Dragon, The Library Dragon audio CD, a Library Dragon flip-doll, a skype visit with author Carmen Agra Deedy, and a signed piece of original artwork by illustrator Michael P. White!